A random experiment which has only two mutually exclusive outcomes, namely ‘success’ and ‘not success’ or ‘failure’ is called Dichotomous Experiment. If a dichotomous experiment is repeated n times and if in each trial the probability of success p (0 < p < 1) is constant, then all such trials are called Bernoulli trails. This term is named after Jacob Bernoulli, a 17th century Swiss Mathematician. Since, Bernoulli trial has only 2 possible outcomes, it can be framed as ‘yes’ or ’no’ question. Is the top card of the shuffled deck an ace? Was the new born child a girl? An experiment of n repeated independent Bernoulli trails is called a Binomial Experiment. Consider a Binomial experiment. Let the outcomes in each trial be a success (S) or Failure (F) with probability p and (1-p) = q respectively. 0 ≤ X ≤ n.
n = 1, 2, 3…. The random variable X denotes the number of successes x in n independent Bernoulli trials. X ~ B(n,p) denotes that X follows Binomial Distribution with parameters n and p.
The Poisson binomial distribution, which describes the number of successes in a series of independent Yes/No experiments with different success probabilities. 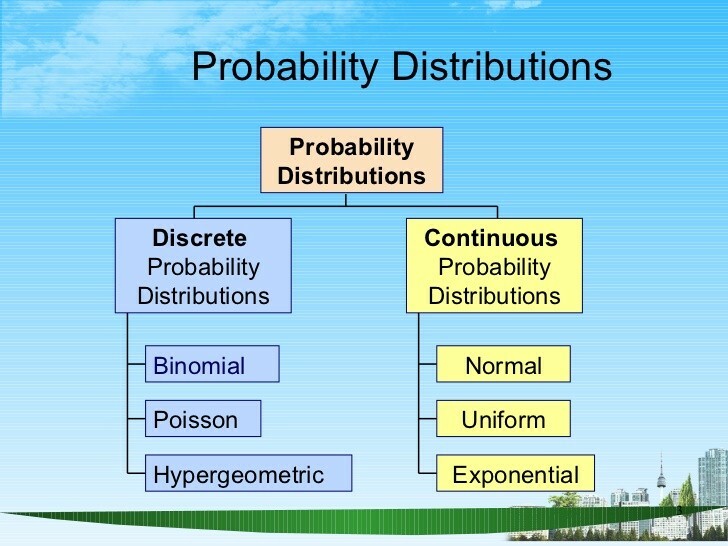 A Poisson distribution is the probability distribution that results from a Poisson experiment. The experiment results in outcomes that can be classified as successes or failures. The average number of successes (μ) that occurs in a specified region is known. The probability that a success will occur is proportional to the size of the region. The probability that a success will occur in an extremely small region is virtually zero. Note that the specified region could take many forms. For instance, it could be a length, an area, a volume, a period of time, etc. A Poisson Random Variable is the number of successes that result from a Poisson experiment. 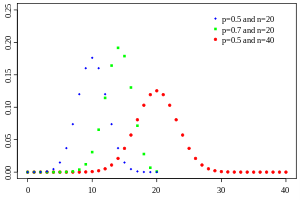 The probability distribution of a Poisson random variable is called a Poisson Distribution. P(x; μ) = (e-μ) (μx) / x! The mean of the distribution is equal to μ. The variance is also equal to μ. To find the probability of success in any dichotomous experiment.